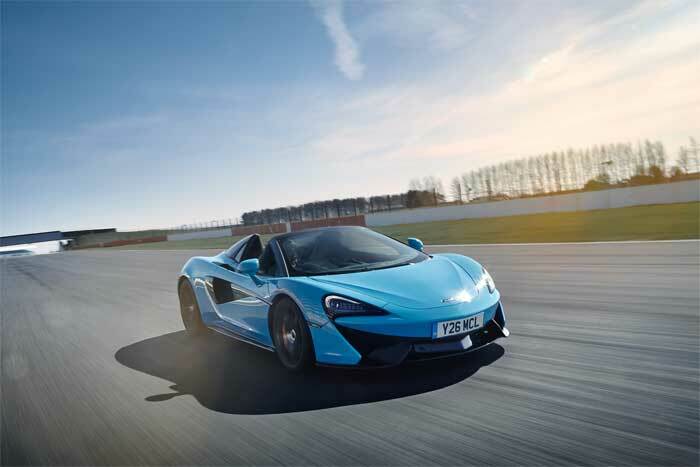 McLaren has announced that the Track Pack that has been available on the 570S coupe is now available on the Spider. The Track Pack sheds nearly 73 pounds of weight from the Spider making it better for track work. There are some cool standard features included with the Track Pack. The features included in the Track Pack are carbon fiber race seats, carbon black Alcantara steering wheel, carbon fiber interior upgrade, and six different McLaren Designer Interior Sport Design themes to choose from. The Track Pack includes the sports exhaust, super-lightweight 10-spoke forged alloy wheels in Stealth Finish and the McLaren Track Telemetry system. The car uses the same 3.8L twin-turbo V8 engine as the normal Spider. That engine makes up to 570hp and the car gets a talker rear spoiler as part of the package. The Track Pack adds £17,160 or about $24,000 to the price of the car when ordered.